Inlet Cove is a charming North Myrtle Beach resort that faces the salt marsh inlet in the Cherry Grove section of North Myrtle Beach, South Carolina. Wake up each morning with tranquil views of the inlet from which gentle breezes blow. Inlet Cove is at the northernmost reaches of the Cherry Grove section of town. The beach is just blocks away from this North Myrtle Beach resort so you have the best of both worlds to enjoy during your North Myrtle Beach vacation. There are two buildings at Inlet Cove and both are only three stories high. This intimate setting is wonderful for a peaceful, relaxing North Myrtle Beach vacation. Between the two buildings of Inlet Cove is a picnic area and on one end of this North Myrtle Beach resort is an inviting swimming pool. The accommodations at this North Myrtle Beach resort are spacious and beautiful. Your family or friends will love all the room found in these three-bedroom North Myrtle Beach vacation rentals. 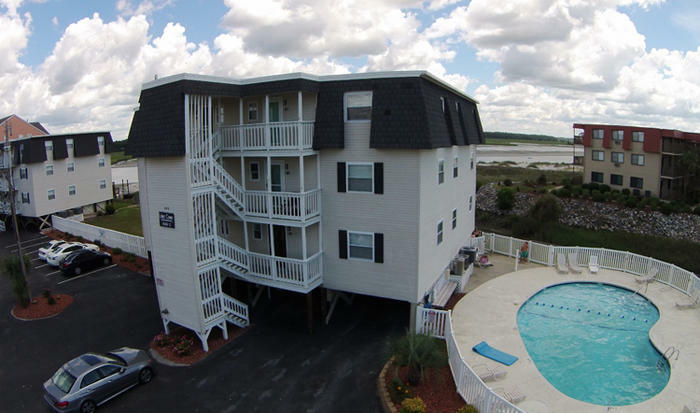 These accommodating North Myrtle Beach rentals sleep up to eight people. With two full baths in these North Myrtle Beach condo rentals everyone will be quite comfortable. Amazing furnishings in these North Myrtle Beach vacation rentals include a well equipped kitchen. There is a full-size refrigerator, oven and dishwasher in these condos in North Myrtle Beach, South Carolina. Serve some snacks or breakfast to the kids in the dining area and admire the water views from the living room of these North Myrtle Beach condo rentals. Additional amenities in these condos in North Myrtle Beach, South Carolina include a washing machine, clothes dryer and DVD player. Off the living room of the North Myrtle Beach rentals at Inlet Cove is a balcony with awe-inspiring views of the salt marsh. You can even see the Atlantic Ocean from this balcony. Wake early and enjoy the early morning sunshine each day of your North Myrtle Beach vacation at Inlet Cove. Walk to the white sandy beach and see the sun come up over the Atlantic Ocean. What a dazzling light show for which it is definitely worth setting your alarm. Slip into the bright blue swimming pool at Inlet Cove and relax while getting a suntan. Lounge poolside with a good book or listen to your favorite tunes while basking in the sun. The landscape around Inlet Cove and the views of the salt marsh are delightful. The beach is within walking distance, just a couple blocks, and it is easy to spend all day enjoying the oceanfront during your North Myrtle Beach vacation at Inlet Cove. Build sand castles, take long walks along the shoreline, comb the beach for seashells and watch the ocean just offshore for passing dolphins. Elliott Beach Rentals is not affiliated with onsite management or the HOA of Inlet Cove.